This last book is probably the least haphazard one of the trilogy with a much clearer direction. Even with new events surfacing that give rise to new plot twists, we’re at least still focusing on one main conflict, even if said main conflict is extremely predictable. Unlike the first two books, I’ve yet to encounter too many dragging moments. 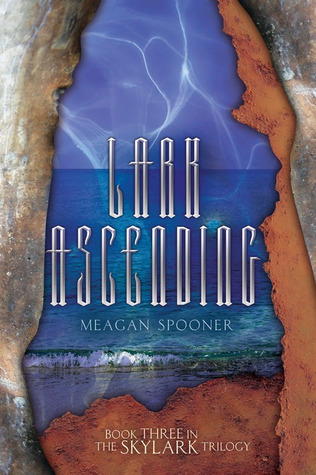 And then, much like the first two books (with the exception of some of the first book), Lark Ascending is fast-paced with an urgent “need-to-know-what-happens-next” narration. At least it has that going for it. However, also much like the first two books, the characters are hard to relate with--I find myself caring very little for them or concerning myself about what happens to them. This book is more plot driven than it is character driven; but as I’d mentioned in the other two Skylark reviews, the characters have a lot of potential for great story. They just don’t seem to come to life in the books. To be honest, this wasn’t a bad ending for the Skylark trilogy, if only because despite having an ongoing conflict that was hard to grasp, each book also had it’s own well-rounded conflict and conclusion. And maybe, aside from that fast-paced storytelling that made the books within the Skylark trilogy easy to read, I can give it a little bit of credit for the above-mentioned well-roundedness of each book’s sub-conflict within the bigger main conflict of the trilogy. Of course, for all the other things I stated in the 62% few paragraphs further up in this haphazard review (characters that are hard to relate with, ready predictability of story direction, uncertainty of each book’s general direction throughout the series…), the overall impression I got from the trilogy was quite less than enjoyable. Makes sense? Probably not. I’m not even quite sure I know what I’m trying to say. Nevertheless, I still managed to fly through the books without too much trouble. Basically, it feels like we’re moving forward in the main series conflict with the start of Lark Ascending. But at the same time, it feels like the book recycles the same formula and storyline from both, the first and the second book. There’s traveling in the dark wilderness outside of the safety of magic-generating cities wherein Lark and her companions are headed to fight another evil. Except that, much like the first two books, she doesn’t know she’ll find another villain to save the world from--she’s just traveling to her destination to find answers she has lots of questions about. And in doing so ends up in another large-scale battle to save lives and overthrow oppression or defeat the bad guys or something like that. There’s a lot of fighting, a lot of bloodshed, a lot of inner monologue-ing angst about darkness and evil and monsters and etc…. The only real difference between this book and the previous two in the trilogy was the fact that (as I’d already stated), the main conflict and the story’s direction are a little more clear cut. It made the book easier to read than the previous two books; I fell asleep less often and got bored less often. I turned pages with a good bit of urgency, curiosity, mostly; wanting to know how the series would tie up; disappointed that there were still a lot of loose ends. Of course, it could also be stated that because the storyline was easier to grasp, so was the predictability of future twists and secret reveals. Even then, it doesn’t mean that the book itself wasn’t chaotic. As a dystopian in a sea of other YA dystopian series/trilogies, Skylark isn’t a terrible set. As I’d stated before, the world created in Skylark has potential; the storytelling and the general YA formula, however, made it into “Just another YA dystopian trilogy”.